I went to opening day of Pixar Fest at Disneyland Resort to check out the food and festivities! I wanted to focus though on my favorite part of Pixar Fest: The Ratatouille dining experience at Cafe Orleans! 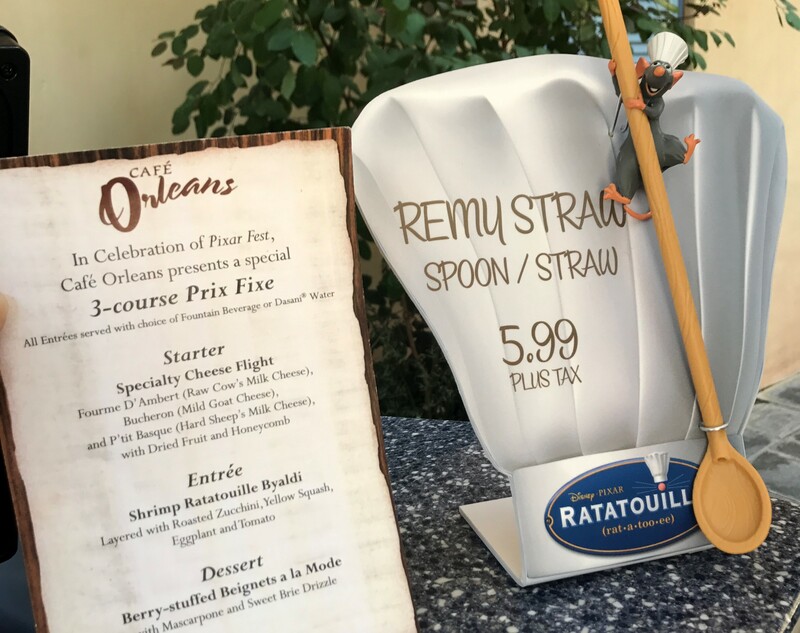 While all the rest of the Pixar Fest dining experiences are more snacks, desserts, and quick service meals, the Ratatouille menu at Cafe Orleans is a table service experience with Pixar flair! The first course is a beautiful specialty cheese flight – complete with gourmet dried fruits and honeycomb. This was my favorite course, being a cheese plate fan this one was superb. The second course was ratatouille, which comes with shrimp, but can be ordered without if you’re vegetarian. Not only was the ratatouille delicious, but it was extra special since it was plated just like ratatouille was in the Pixar film at Gusteau’s. The third course was berry-filled beignets served a la mode. I am typically not a beignet fan, but these ones weren’t overly sweet, and since they were berry-filled they did feel as dry and bready as a typical beignets. And since they were small, they were the perfect sized dessert, especially if you’re splitting the Ratatouille 3-course menu with someone. Another special item you can purchase is the Remy straw, which looks like a spoon with Remy hanging off of it. Something to note, you can only purchase the straw if you are dining in the restaurant. Since Cafe Orleans is a popular restaurant, and I expect it will be even more popular over the next few months with the special Ratatouille menu, I highly recommend making reservations to dine at Cafe Orleans here. Special Pixar Fest Ticket and Hotel Savings! If you’re heading to Pixar Fest to try the delicious food too, you can get some great ticket and hotel savings from Getaway Today! They are offering 3-day park hopper adult tickets for the price of kids tickets here, as well as $10 off 2-night hotel stays using code healthy10 when you book these deals by April 17, 2018. I hope you and your family have as much fun at Pixar Fest as me and my daughter did! Mickey Mouse Beach Collection at Target!